A study abroad experience is a significant investment-but one of the best investments for a student’s future because it demonstrates intercultural competence that is appealing to potential employers and graduate schools alike in our increasingly interdependent world. All meals aboard the ship are included. Even on days in port. Over the course of the semester you will sail to 10-12 destinations. All participants are automatically enrolled in a Premium Health insurance plan for the voyage. This includes access to the shipboard medical clinic, mental health center and in-port emergencies. All student cabins are equipped with a close-circuit TV, mini-refrigerator, closets (with hangers) drawers, a restroom (shower, toilet, cabin space), and a safe shared between cabin mates. Linens, towels and cabin cleaning are provided daily by cabin stewards. Outside Triple Cabins have a window, and a third bed that pulls down from the wall. Outside Double cabins have a window, are equipped with close-circuit TV, mini-refrigerator, closets (with hangers) drawers, a restroom (shower, toilet, cabin space), and a safe shared between cabin mates. Linens, towels and cabin cleaning are provided daily by cabin stewards. 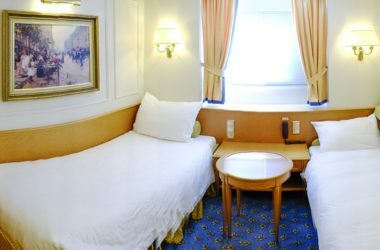 Single Cabins Are placed on Deck 3 with economy doubles and triples. However the singles are larger and have more storage. Note: The decor and appointments differ from the cabins on decks 4 and 5 but come with the same amenities. All student cabins are equipped with close-circuit TV, mini-refrigerator, closets (with hangers) drawers, a restroom (shower, toilet, cabin space), and a safe shared between cabin mates. Linens, towels and cabin cleaning are provided daily by cabin stewards. *Note: Picture is of an Outside Single cabin. Inside Single cabins do not have a window. Outside Single Cabins have a picture window, and are placed on Deck 3 with economy doubles and triples. However the singles are larger and have more storage. 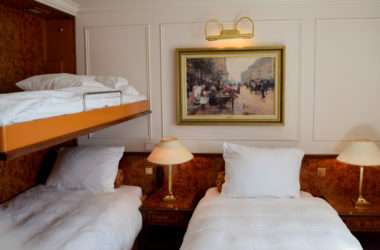 Note: The decor and appointments differ from the cabins on decks 4 and 5 but come with the same amenities. In advance of sailing, the Institute for Shipboard Education may enact a fuel supplement surcharge for all participants in the event that the average price for the blended types of fuel and related costs during the voyage is expected to exceed $85 per barrel. Historically this cost has been up to $9 per person per day, but may vary due to the volatility of the market. You may have certain rights to cancel without charge in the event of certain fee increases. See ticket contract for details. Expenses related to travel to and from the ports of embarkation and debarkation, textbooks, in-country travel, personal spending, and incidental fees are additional. Payment options include: check by mail, credit card (Visa, Mastercard, Discover, American Express), or E-check via your MyPassport page. Please note that a 2.7% service fee will be added to all debit/credit card transactions.